There are many published works that expand upon the Characteristics of Complex Systems. Key amongst these are the works of Jay W. Forrester. 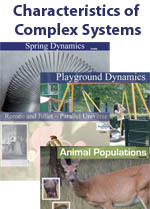 Please use the following resources to help further your understanding and appreciation for complex systems.